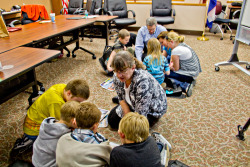 Joplin Students Help with the Design of their New School. Since the tornado that struck Joplin on May 22, 2011, Sapp Design Associates Architects has been working closely with the Joplin School District on projects like the 65-day rebuild of the Franklin Technology Center and now the design of the new Irving Elementary School. For months we have been working with teachers, parents and administrators to formulate a sound plan for the new school. Tuesday 1/31/2012, was a very exciting day for the design team because we got the opportunity to work with a very enthusiast group of Joplin Elementary School Students on what they thought their new school should look like. Through a series of slide shows, word games and one-on-one interaction, the team was able to gain information that will truly affect how this elementary school is designed. The input we received was anything but elementary – no pun intended. The feedback from the students was truly useful information with comments such as “we like windows but not the glare on the smart boards” and “I like big open spaces.” Overwhelmingly, the one design element they all agreed on was COLOR and MORE COLOR!!! Now, our task is to interpret the student’s concerns and ideas into a design that will be a school for the 21st Century.